We are in Washington, D.C., this week to ask Congress for its continued support for restoring and protecting an irreplaceable natural national treasure: Puget Sound. A healthier, cleaner Puget Sound benefits everyone who lives, works and plays here — but the advantages of a vibrant Sound extend far beyond Washington. Our region is a hub of trade, innovation, cultural and natural resources with importance to the nation’s economy and imagination. We’re bringing our stories of problem-solving and collaboration to Congress because we think the lessons we learn here as we seek to restore Puget Sound can work for estuaries across the country. Bird's eye view of Puget Sound. Photo by John Marshall. Puget Sound Day on the Hill has become an annual tradition. Along with representatives of local and tribal governments, state agencies, other non-profit organizations, academia and businesses large and small, we’ll meet with Washington’s congressional delegation and representatives from federal agencies to talk about what federal support for our estuary’s recovery means on the ground (and in the water). We’ll also participate in a panel discussion to share some of Puget Sound’s innovation stories with members of Congress and their staff from across the country. 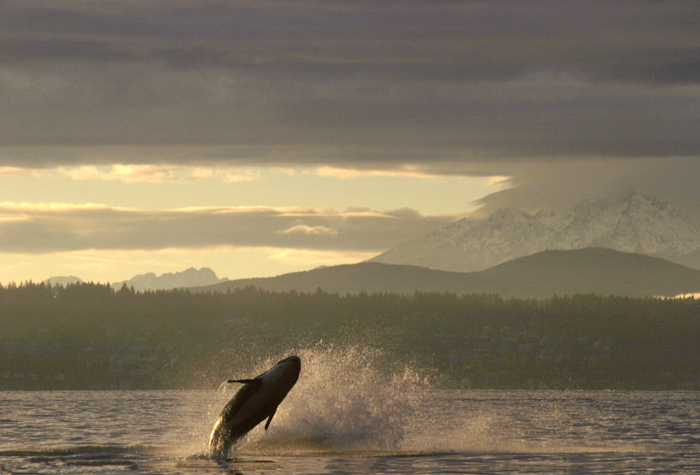 Orca whale breaching off Bainbridge Island in Puget Sound, near Seattle, Olympic Mountains in the distance. Photo © Joel Rogers. Congress has supported strong funding for Puget Sound recovery over the years, including through the Environmental Protection Agency’s Geographic Program and National Estuary Program and through NOAA’s Pacific Coastal Salmon Recovery Fund. These federal investments, together with state, local and private funds here at home, have helped us in Washington state tackle some major challenges and threats to our way of life. But we have a long way to go — to save our endangered Southern Resident killer whales from extinction, to recover salmon statewide, to preserve farmland and fishing-dependent livelihoods and to keep our booming population safe as our cities’ infrastructure ages. Follow along on Twitter with our staff as we visit with our representatives in Congress. In Washington State, shellfish aquaculture is an important piece of our heritage and culture, contributing $270 million to the annual economy and 2,700 local job. But how does aquaculture affect the marine environment? We’re embarking on a new partnership that will advance genetic science to complement recovery efforts for the Southern Resident orca population. With your help, we’re making a healthier home for orcas, and all of us. Last week, members of our Puget Sound team took off for Washington, D.C., to meet with members of Congress to talk about our favorite estuary’s importance to our national economy and our region’s identity. At the 30th Salish Sea Conference, we worked on healing ourselves and healing the sea.